Music through music education is a key that unlocks a world of fun and learning for kids. Introducing children to music through educational games in their early life can greatly improve their cognitive functions, problem-solving, analytical brain, and creative intuition. Kids can have fun and learn about music, math physics, material sciences and more, just through playing some fun and educational musical instrument games. Percussion musical instruments like the drums or the tambourine are the basis for much of a child's early music education, though many older kids also love learning to play more complex musical instruments like the x﻿﻿﻿﻿ylophon﻿﻿e, the electric guitar or acoustic guitar, the flute, and the violin. As soon as they begin to assimilate noise with rhythm, they are primed and ready to unlock their musical potential, as well as to foster a lifelong love for the craft. Whether they grow up to be the next Mozart or not, music has been proven to greatly strengthen the brain and intellect of young children in developmental stages of life. So, put on your favorite tunes, grab a nice frothy can of cola, and kick back while we present some great educational games / musical instrument games with worksheets and more for kids of all ages. Whether at home or in the classroom, the best music instrument games will serve to teach kids about music while they have a ton of fun. Big classes, small classes, one-on-one tutoring and every group in between will find something that makes them laugh, sing and think – sometimes, at the same time. From creating music to naming instruments or interacting with their favorite Disney characters, kids will love learning about music while playing with their parents and teachers. For a small group or a big class, you can't beat bingo. 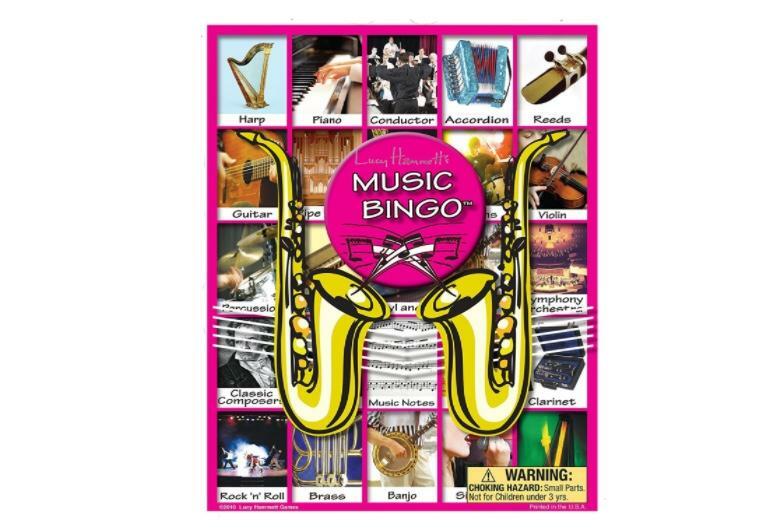 Music Bingo Game is just what it sounds like: A creative twist on the classic game of bingo, catered to early music comprehension and education. What word describes how high or low a note is? What’s a portable music instrument with a keyboard called? Improve memory recall ability in children while teaching them the names for instruments with Instruments Match Stacks. 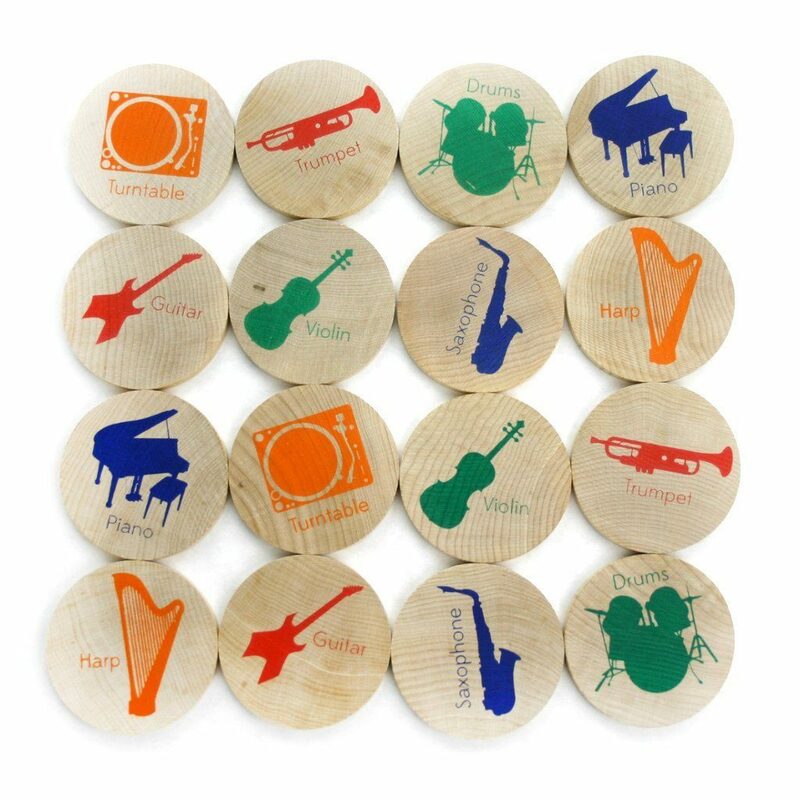 Very simple and fun for young children, each disc is printed with the image of an instrument which players must match with the others of the same type. It includes 16 instrument discs all made from hardwood and finished silky smooth. 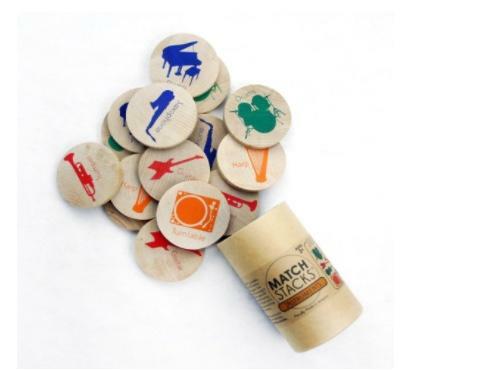 High-quality craftsmanship meets a simple game of memory recall and music instruments education, with Instruments Match Stacks, by Tree Hopper Toys. 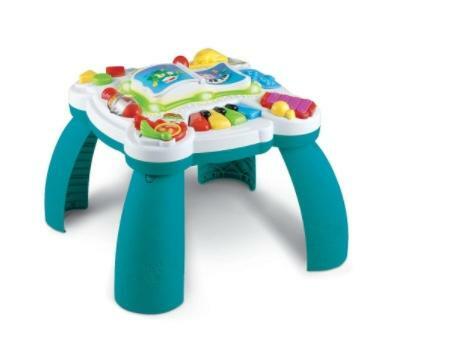 LeapFrog offers toddlers, infants, and babies a true musical joy with the Learn and Groove Musical Table Activity Center. A wonderland of auditory and visual wonderment, little ones can interface with the table’s multitude of games, activities, sounds, and songs. LeapFrog has built the Activity Table to grow with your child, as the feet are removable for kids who can't quite stand yet. With over 70 stimulating musical tunes, kids can learn, explore, discover, and create musical genius, all with the Learn and Groove Musical Table Activity Center. There's nothing quite like Walt Disney to get kids interested in learning. Little ones can play with some of their favorite Disney friends while making music on a big electric keyboard floor-mat. The keys are color coded so that kids can begin to understand the notes of the keyboard. With 5 pre-programmed tunes, children can dance and play along with familiar songs or play a music memory game. 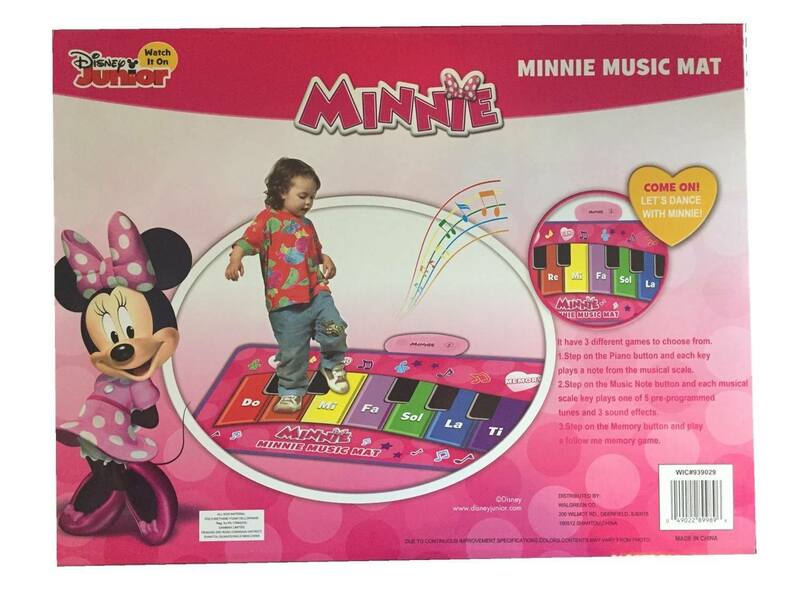 Minnie’s Music Mat by Disney Junior is a great musical instrument toy to get kids learning about the piano keys while they’re having fun. Just about anyone can find something to have fun with in this kid’s music instrument set. What is more fun than making a whole bunch of noise with a group of other kids? Probably nothing! Rock the walls and stomp the yard with this Musical Instrument 28-piece precision set, by iPlay iLearn. 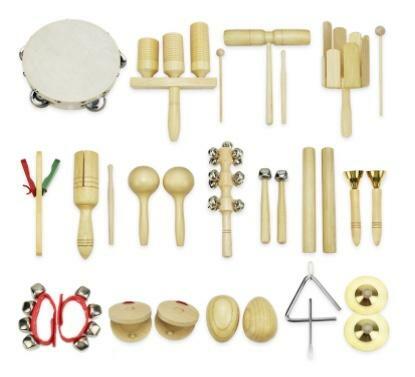 From maracas to tambourines to bells and triangles – and everything in between – every kid will have some kind of noise maker to use for a wide variety musical instrument games. No matter how big your group is, and no matter how young, there's a music instruments game that is perfect for the enrichment of the children's musical literacy and musicianship potential. From the ground to the table to the dance circle, music can be thought as soon as a child is born. Give your child, group, or class the lifelong gift of a musical foundation with one of these kid’s musical instrument games. Thanks for reading! Feel free to leave comments or questions and be sure to subscribe to our newsletter for weekly updates on new and fun kids’ music trends and products!